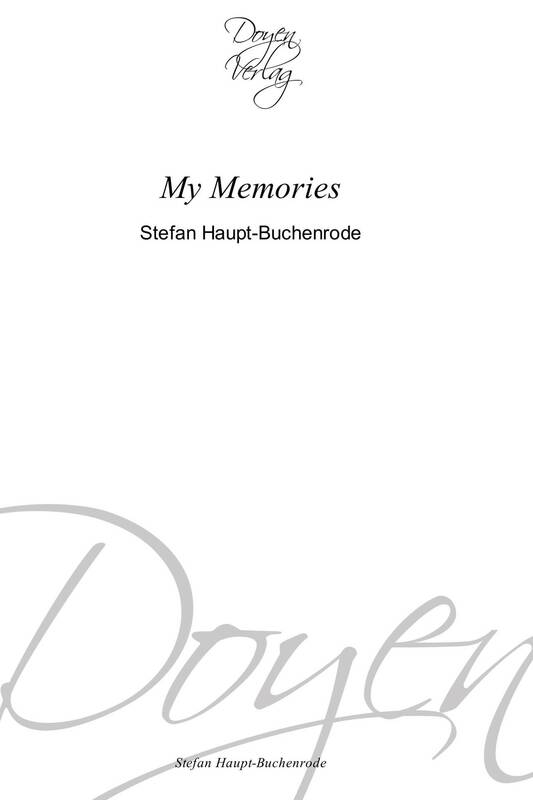 “My Memories” is the agitated history of a noble family before, between and after the two world wars in Middle-Europe. History, trips, hunting, music and politics in the past and the new start in Brazil and Austria of this family, whose leitmotiv of their coats of arms is PRORSUM (go ahead in Latin). Dr. Stefan Baron Haupt-Buchenrode (1869-1945) was born in Brünn, landowner in Zlin (Moravia), later in Hungary and Slovakia, wrote his memories for his family as a refugee at the age of 80 in Rio de Janeiro. Studied in Vienna and Heidelberg. Appointed to Japan as a young diplomat, but quit the diplomatic carrier after marrying Baroness Hedwig Pfuhl. As Vice-president of the great-landowner party he represented Moravia (a part of the Austro-Hungarian Monarchy) at the Berlin Conference in 1916.When on a special mission of the Austrian Ministry of Commerce in Switzerland, he was appointed ambassador to Switzerland in 1918. After the war he lived in Slovakia, than Salzburg and finally in Rio de Janeiro, Brazil. Many interesting facts of all of his descendents – all over the world – are included.